I saw a baby at work who came back to the hospital for something, and she was wearing the cutest hooded sweater that zipped up the back. Her grandmother had knit it for her, and she said that she had found the pattern on Ravelry. After searching on the site, I settled on "Zip up a Baby Sweater" from Decorating and Crafts Magazine, March 1982. So far, it doesn't seem very intuitive, but it's also been quite awhile since I've knit anything challenging other than socks, so I'm sure I will figure it out. 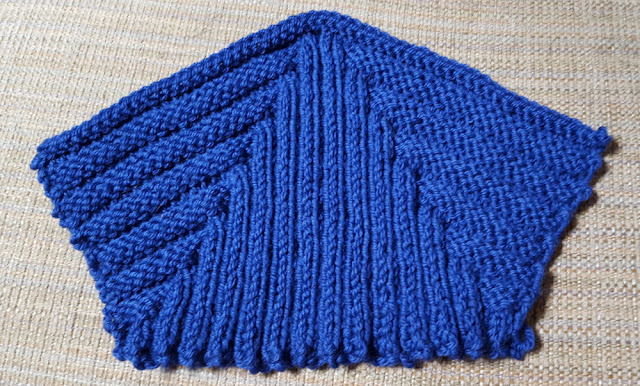 I'm using Cascade 220 superwash, and here is a photo of the just-finished hood, which gets bound off and folded before picking up stitches at the bottom. 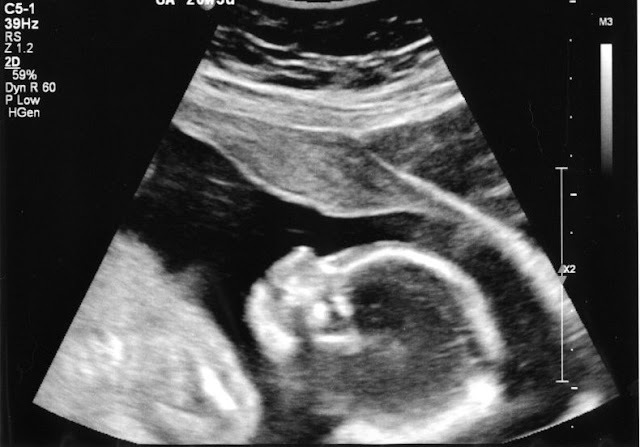 Yep, that's the grandson at 20 weeks plus 3 days' gestation. I guess the "kids" got to see him from every angle possible, and really loved seeing him move around in real time. Kinda cute, don't you think? This is the project I jumped to once I found out I wouldn't know the baby's name until he is born. Once the sweater is done, I'll go back to stitching the Christmas stocking, and work on that until I get to the name part, at which point I will tuck it away. On the baby blanket front, I zigzagged and cut them apart this morning, and hope to stitch at least one hem so I can bring it to work and let my nurse friends feel how soft it is. I just cannot get enough of fondling the cloth! !